What is Guest Blogging and Should I Be Doing It? Guest blogging is exactly what it sounds like. A guest blogger is a writer who posts an article on someone’s blog with the intention of creating a connection with a new audience, as well as improving search engine optimization (SEO). The goal is to blog about topics that an audience would be interested in and that they can learn from. Blogging for your industry helps you (or your brand) become an authority in your field. Furthermore, a well written guest blog is an asset to your SEO linkbuilding strategy. With that said, relying solely on guest blogging as a way to gain links back to your site isn’t a ideal practice, and there are a few reasons why. Earlier this year Google’s Matt Cutts declared that guest blogging for SEO is dead. That is a bold statement, but don’t panic. His argument is that over time, guest blogging has become a spammy practice instead of a legitimate form of writing and a respectable way of link building. Increasingly, guest bloggers have been abusing the blogging community by trying to pay for a higher Google PageRankings (which is a big no-no) and even worse, try deceive users by filling content with spammy links. Cutts is not talking about quality multi-author blogs with valuable content, he is referring to low-quality, spam sites that use “guest blogging” as their solitary strategy for link-building. We use the internet all the time, we know what kind of spammy practices he’s talking about and we tend to ambivalently accept this kind content. What does this mean for the future of guest blogging? It means that we have to get back to basics. As a brand or as a writer, don’t try to get on any low-ranking, low-quality blog just for the link. Instead, create content that will be useful, unique, and interesting in order to teach your audience something new. Instead of focusing on gaining back links, put your effort into Inspiring your audience to be a part of a new community. It’s this that will truly expand your brand. First of all, check out Google’s quality guidelines for best guest blogging practices because you certainly don’t want a smack on the wrist from Google. The next step is to find sites relevant to your niche or industry. You want to get exposure on a site that has content focused on your industry and an audience that is interested in your field. Another tip is to determine if the blog owner stays abreast with industry current events and is active on social media (that way you will know your work will be promoted on their site). When you do find a site that you would like to guest blog for, read and adhere to the site’s guidelines as well. You don’t want to fall victim of producing spammy, poorly written work just for a link back to your site. You blog post is not about you, your product, or advertisements. It’s about appealing to your audience so they see you as an authority in the industry! The content you write should be valuable information within your industry’s niche. Once you have produced well written, useful content, the links you do include should flow naturally throughout. Reserve links that go back to your site for the guest biography at the end. The link should be embedded in your focus keyword text (consider where you want the reader to go). Review the blog you want to make a submission to, make sure that your piece is formatted in their preferred way, and that any images you include are quality, legal, and ready for web publishing. Finally, be the best blogger you can be. Aim to be a trusted face in the blogging community by getting to know your audience. You can do this by having a call to action at the end of your post and reply to relevant comments, get involved on blogs you want to guest post on, and get involved in the social media communities pertinent to your industry or brand. Reach out to blog owners with personalized emails, tell them who you are, why you want to be a guest blogger on their site, propose an idea or two for them to chose from, and send them a link to some of your work (i.e. your own blog). Just remember that only good information and quality content is valuable to your readership! 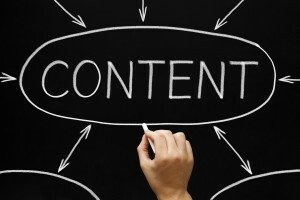 If you have more good tips on the future of content marketing and internet marketing we would love to hear about it!